This has really been a busy week with a lot great information coming out. Interesting news and relief for some about Origin in Dev notes from Allison Berryman. Please read in Dev notes about passwords by Courtney Woods. Fansite Summit 2 also happened this past weekend and we got to see the “unboxing” of the Collector’s Edition, more information about Open World PVP on Ilum, more about Voidstar, Flashpoints Operations and much more. We also found out about a new set of invites going out November 8th for players around the World. Be sure to check your email and spam folders. Hi everyone! We’ve seen some continuing confusion over this topic. Some of you have quoted text that appears on the Pre-Order Page that indicates you’ll need to install Origin software to download the game. We are working to update the information on that page: you will not be required to install the Origin software in order to download, patch, or play the game (even during Early Game Access). You’ll do that through our own site and launcher. As we prepare to launch Star Wars™: The Old Republic™, we want to ensure that your account and personal information are as secure as possible. To that end, we will begin implementing new security features in the www.StarWarsTheOldRepublic.com website that are designed to further protect you. This process includes a refresh of our password security requirements. To make sure that all accounts comply with our new security measures, members of the Star Wars: The Old Republic community who created accounts on StarWarsTheOldRepublic.com on or before October 21st, 2011 will be required to reset their password in order to meet with these new standards. Those members who created an account after October 21st, 2011 will not receive an email and do not need to update their passwords. Click the ‘My Account’ button on the top navigation bar. You may be prompted to re-enter your login details. Click on the ‘Reset Password’ link in the Account Management list on the right-hand side. Complete the following form with your old password and new password. Click the ‘Login’ button on the top navigation bar. Click on the ‘Forgot your SWTOR.com password?’ link. Enter the email address you used to create your StarWarsTheOldRepublic.com account. An email will be sent to that address. Follow the instructions in the email to reset your password. Over the next few weeks, we will be sending out emails to anyone who has not already reset their password to ensure they do so. Your Star Wars: The Old Republic account credentials are linked to EA.com and Origin.com, so your new password will be applied across all three websites. If you have any difficulties in updating your password, please contact our Customer Service team who’ll be happy to assist you. Does this password upgrade mean that there have been any issues with security on StarWarsTheOldRepublic.com? Absolutely not. Upgrading our security measures ensures that your account is more secure than it previously was. There have been no breaches or compromises of any data on StarWarsTheOldRepublic.com. I thought my password was pretty secure. Why do I have to change it? It’s possible your password is already quite secure, but doesn’t meet or exceed the new security requirements. I haven’t received an email yet. Should I go ahead and reset my password now? Yes, please do. Whenever you reset your password, you’ll be prompted to use the new security measures, so it can be changed from any time onwards. Will I have to reset my password again in future? While we do not anticipate you will need to reset your password again because of our security measures, it’s always a good idea to change passwords on any secure site on a regular basis. Do these changes affect any other part of my account? For example, do I need to opt-in for Game Testing again? No, these changes do not affect your account in any other way. You do not need to opt-in for Game Testing again, or make any other changes. Make sure you have followed these instructions and updated your password. Security is a serious thing. Let’s do our part to help. This week Georg Zoeller met with those attending the Fansite Summit 2. He discussed how developers are using metrics to make the game better. Zoeller goes on to mention he is a “min/maxer” gamer. Player feedback about an issue is always listened to first, and they use the math, data and statistics to figure out how best to fix the issue. There is a lot of real straight talk from him and I really think it is a great listen. Kudos goes to one of the fansites, for recording the presentation. You can click the following link and listen to the recording via our friends at TORWars. Having problems getting use to the time change? Have you been in a rush running errands getting for the various holiday and family gatherings? Well if you missed anything don’t worry a bit, Corellian Run Radio has you covered! Just below we have all the top stories just a click away. The image this week takes us to the Eternity Vault. 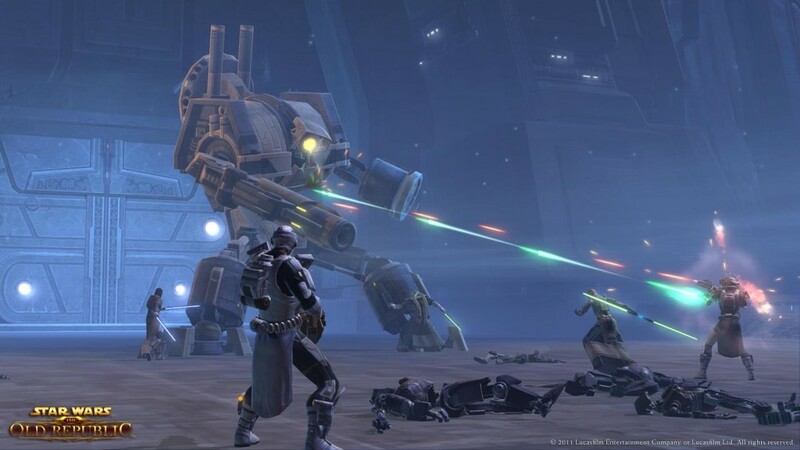 We see Republic forces battling the huge battle droid guarding the entrance. How many of you are ready to take on this endgame operation? This week we have another fan created Star Wars music video, by RPGKing79 on YouTube.com. It is a great blend of cinematics and gameplay footage, and lots of new footage from Ilum and the Imperial Agent progression. He takes this footage and puts with the music from the group, Evanescence. A nice slowly paced beginning that builds to a great combination of exciting video clips and faster paced music. Take a look and let us know what you think in the comments below. That’s all this week from the HoloNet Links at Corellian Run Radio. Only 39 days till release folks! Can you believe just a little over a month away? If you have an interesting, funny, or thought provoking Star Wars Old Republic link, please let me know via email at jason@corellianrun.com, join the CRR forums, or in the Facebook group. See you next week!